Bitcoin, with its market value among cryptocurrencies and being the biggest in terms of its processing volume, carries great potential in terms of low cost, speedy processing and low-level risk while also bringing with it important global-level change and transformation. On the other hand, the fact that cryptocurrencies and Bitcoin specifically are new, of unclear legal status, and carry the risk of being involved in illegal activity, there is the potential for their use as an extremely volatile and speculative investment tool and have environmental effects. This study examines Bitcoin mining and blockchain technology and investigates the high amounts of energy consumed by Bitcoin and its environmental effects. It is argued that the energy consumed as a result of increased Bitcoin mining will have environmental and social consequences, such as global warming and climate change. Bitcoin ATM Industry Statistics / Charts, https://coinatmradar.com/ (accessed 3 Jan 2018); “Coinmap”, http://coinmap.org (accessed 3 Jan 2018). Baur D. G. Hong K. and Lee A. D. (2016) Bitcoin: Currency or Asset?”, Melbourne Business School, 2016 Financial Institutions, Regulation & Corporate Governance (FIRCG) Conference, 22 February. Bouria E. Molnárb P. Azzic G. Roubaudd and D. Hagforse L. I. (2016) “On the Hedge and Safe Haven Properties of Bitcoin: Is it Really More Than a Diversifier?”, Finance Research Letters, Volume 20, pp.192-198. Ciaian P., Rajcaniova M. and Kancs d. (2016) “The Economics of BitCoin Price Formation”, Applied Economics, 48(19): 1799-1815. Dahan M. and Casey M. (2016) “Blockchain Technology: Redefining Trust for a Global, Digital Economy”, The World Bank, 16 June 2016. Digiconomist (2017b) A Deep Dive in a Real-World Bitcoin Mine, viewed 25 September 2017, https://digiconomist.net/deep-dive-real-world-bitcoin-mineDorfman J. (2017) Bitcoin Is An Asset, Not A Currency, Forbes, 17 May 2017. Glaser F. Zimmermann K. Haferkorn M. Weber M. C. Siering M. (2014) “Bitcoin-Asset or Currency? Revealing Users' Hidden Intentions. Revealing Users' Hidden Intentions”, Twenty Second European Conference on Information Systems. Hileman G. and Rauchs M. (2017) “Global Cryptocurrency Benchmarkıng Study”, University of Cambridge, Cambridge Centre for Alternative Finance. Kristoufek L. (2015) “What Are the Main Drivers of The Bitcoin Price? Evidence from Wavelet Coherence Analysis.” PloS one, Vol.10, Num. 4. Marian O. (2013) “Are Cryptocurrencies Super Tax Havens?”, 112 Michigan Law Review First Impressions, 38. Mishra S. P. (2017) “Bitcoin Mining and Its Cost”, University of Texas at Dallas - Naveen Jindal School of Management. Nakamoto S. (2008) “Bitcoin: A Peer-to-Peer Electronic Cash System”, https://bitcoin.org/bitcoin.pdf (accessed 2 Jan 2018). O’Dwyer J. K. and Malone D. (2014) “Bitcoin Mining and its Energy Footprint”, Hamilton Institute, National University of Ireland Maynooth SSC 2014 / CIICT 2014, Limerick, June 26–27. Powercompare (2017) “Bitcoin Mining Now Consuming More Electricity than 159 Countries Including Ireland & Most Countries In Africa”. The Economist (2015) The Promise of the Blockchain: The Trust Machine. 31 October 2015. Vigna P. and Casey MJ. (2016) The Age of Cryptocurrency: How Bitcoin and the Blockchain Are Challenging the Global Economic Order. Picador. Walt E. V. Gao G. Biesheuvel T, and Warren H. (2017) Coal Is Fueling Bitcoin’s Meteoric Rise, Bloomberg, 15 December 2017. ISNAD Dilek, Şerif , Furuncu, Yunus . "BITCOIN MINING AND ITS ENVIRONMENTAL EFFECTS". 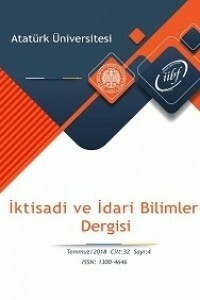 Atatürk Üniversitesi İktisadi ve İdari Bilimler Dergisi 33 / 1 (February 2019): 91-106.